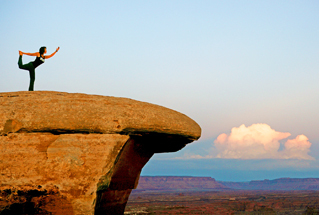 SALT LAKE CITY, UT, Jan. 4, 2018 – A newly enhanced series of programs for 2018 dubbed Balance & Flow Wellness Trips hone in on Nature’s capabilities for spiritual and physical healing, thanks to Holiday River Expeditions (https://www.bikeraft.com/). This veteran travel company will now present six of these specialty trips in 2018 between early June and early September. These include two new adventures that combine yoga with stand-up paddle boarding or with mountain biking. 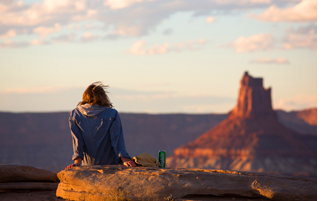 The itineraries focus on fitness, mindfulness and wilderness immersion. The ingredients are top-notch facilitators; wild rivers for rafting, kayaking and stand-up paddle boarding; backcountry hiking and biking trails; beaches that embrace wild yoga; and a balanced vegan cuisine. Following are the journeys of personal discovery scheduled for 2018. 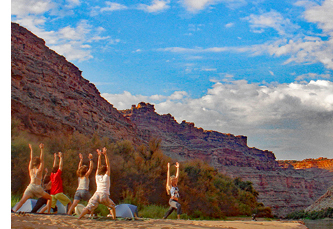 Wild Yoga Journey on the River with Rebecca Wildbear is a six-day (June 4-9, 2018), 84-mile rafting and yoga journey through Desolation Canyon on the Green River in Utah. The per person rate is $1,300 plus a $25 Bureau of Land Management (BLM) fee. 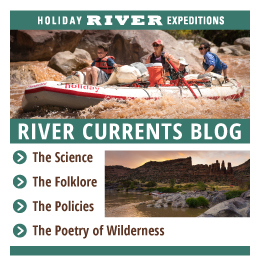 The momentum of passing through 60 whitewater rapids crescendos as Rebecca Wildbear, M.S., creator of Wild Yoga and a therapist and wilderness guide for 17 years, helps guests open their sensory bodies, engage their dream world and access their deep imagination. When not running rivers, she also leads programs with Animas Valley Institute and is on the faculty at Nosara Yoga Institute. For details see https://www.bikeraft.com/balance-flow-trips/wild-yoga-trip/. 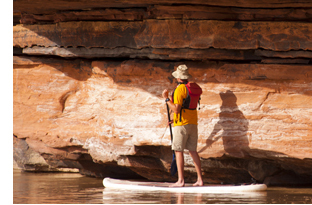 Adventure Fitness with Kathleen Leopardi is a four-day (July 19-22, 2018) trip that will include all the adventures a river trip has to offer: stand-up paddleboarding, inflatable kayaking, hiking, swimming and the rush of paddling through Class IV rapids under the steep walls of Ruby and Westwater Canyons near Arches and Canyonlands national parks in Utah. There’s also the option of stretching and doing some core work along with the peaceful meditation of Yoga. The per person rate is $985 plus a $20 BLM fee. Kathleen Leopardi owns Personal Training Zone, a Utah-based fitness facility. For details see https://www.bikeraft.com/balance-flow-trips/adventure-fitness-trip/. Mindfulness with Sean D’Amboise is a four-day (July 27-30, 2018) river retreat through Lodore Canyon on the Green River in Colorado. This journey combines new ways of starting or improving sitting and walking meditations, mindful movement, hiking, unrivaled natural beauty and exploration. The per person rate is $1,065 plus a $22 National Park Service fee. Sean D’Amboise, a Holiday River guide alumnus, is a new facilitator. He is enrolled in a three-year mentorship program, The Embodied Life®, an approach to human transformation based on the integration of meditation, Feldenkrais® movement and self-inquiry. For details see https://www.bikeraft.com/balance-flow-trips/mindfulness-trip/. 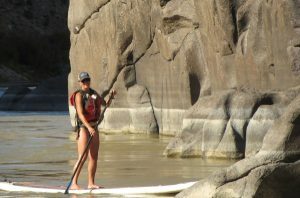 Stand-Up Paddle Boarding & Yoga on the River with Melanie Webb is a new four-day (Aug. 9-12, 2018) Colorado River journey through Ruby and Westwater canyons combining the thrills of a traditional Colorado River rafting vacation with exciting Class IV rapids. Guests also paddle board and kayak in calmer waters. The per person rate is $985 plus a $20 BLM fee. Melanie Webb is a Certified Personal Trainer, Stand Up Paddle Instructor and owner of Sol Fitness Adventures featured on Good Morning America, and in major publications. She is an ambassador for Earth River SUP Paddle Boards. For details see https://www.bikeraft.com/balance-flow-trips/stand-up-paddleboarding/. Vegan Wellness Trip with Tess Challis is a four-day (Aug. 30-Sept. 2, 2018) rafting trip through what is often referred to as a miniature Grand Canyon, the stretch of the Colorado River coursing between Utah and Colorado in Westwater Canyon. The per person rate is $985 plus a $20 BLM fee. Tess Challis, author, vegan chef and wellness coach, brings 15 years of experience as a professional chef to the backcountry kitchen, preparing amazing, healthy, vegan meals each day. She also shares her own personal journeys through chronic illness and disease to veganism and healthy living. For details see https://www.bikeraft.com/balance-flow-trips/vegan-wellness-trip/. 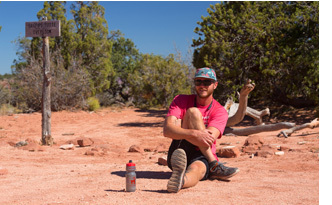 Yoga & Bike on the White Rim Trail with Katie Woods is a new four-day (Sept. 29-Oct. 2, 2018) two-wheel exploration of Utah’s Canyonlands National Park. The per person rate is $985 plus a $10 park entrance fee. Katie Woods completed her RYT (registered yoga teacher) 500 in December 2017. She is engaged in a group project focused on creating a yoga mindfulness and movement curriculum to offer to educators serving within the Utah school system. A certified athletic trainer, she is a full-time professor in the undergraduate athletic training program at the University of Utah and has worked with athletes at the Olympic level. She believes that yoga has the power to fix many (if not all!) of the problems in our communities today. For details see https://www.bikeraft.com/balance-flow-trips/yoga-bike/. For more details on these trips please see: https://www.bikeraft.com/balance-flow-trips/.